Motorcycles, tortillas and fever, oh my! In the Peten Department of Guatemala, where the weather is really hot, mosquitoes and bad roads are abundant and chronic diseases of hypertension and diabetes of the United States are prevalent here too. I had the pleasure of spending 3 weeks here experiencing medicine completed by physicians and community health workers a like. During my three weeks in the north-eastern portion of Guatemala I worked in multiple different cities/towns in different types of clinics and saw many different aspects of medicine. During my trip, there were many different unique aspects of medicine that I found truly endearing and that will forever hold a place in my heart. First, in my first few days in the country, while I was trying to get acclimated to the sweltering heat, I saw infectious diseases, both clinically and under the microscope, that are not regularly found in the United States. These included Malaria and different parasites. Interestingly, I also witnessed cases of Chickenpox during a community visit. Chickenpox is rarely found in the United states following vaccination production. Other diseases that are widely prevalent are those similar to those of the United States including diabetes and hypertension. During my time in different clinics I was able to see what medications are the first lines of treatment for those chronic disease and compare them to our treatment here in the United States. While the diseases were similar and different to those in the United States, another aspect of my trip that I really enjoyed was the people. Rewarding experiences included patient encounters, especially when patients were really happy with the outcome of their care. An example of this was during a visit with a late 50-year old woman who came to the clinic with complaints of growths on her face that have been getting worse over the last 2 years. During this time with this patient was interested in finding out what the growths were - in fact it ended up being two large squamous cell skin cancers. Subsequently, patient wanted to get them removed and returned to the same clinic 2 days later and was able to remove these large portions of her skin using sterile procedures; this was a great experience because we would not do these procedures in our own clinics in the United States. Furthermore, while the patient encounters were rewarding working with the community health workers was a different experience that I was not accustomed to and found beneficial for my future practice as I hope to be a teacher to health workers in other countries in the future. 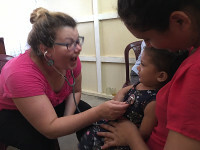 Ultimately, I learned that all my experiences whether it's community visits, trips to the ministry of health, watching a local community health worker provided gynecological care or dental care (including teeth extraction), while they may seem trivial, may be beneficial to my future adventures in global health.